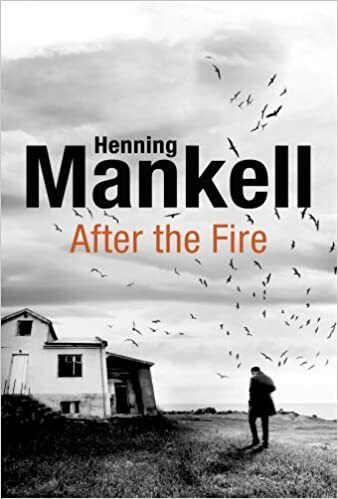 Having not read any Mankell books previously I was intrigued to read After the Fire by Henning Mankell. Fredrik Wellin lives alone on a small island off the coast of Sweden amongst an archipelago of islands both inhabited and not. He is a retired doctor in his seventies. He wakes suddenly to find his house ablaze. His house is burnt to the ground and he has what he stands up in. This is the story of the aftermath. There is a dark/bleak immediacy to the writing from the start. I’m not Fredrik’s age however I have some understanding of his thoughts and I was quickly engaged with him. It feels very like an old man seeing the world – exactly right. It is fair to say that Fredrik tends to find things about the world that don’t suit him. From the investigation into the cause of the fire to his attempts to buy new wellington boots, there are difficulties. For quite large parts of the book very little happens. We get quite extensive information into Fredrik’s background both personal and that of his wider family. Some of this was interesting, sometimes the minutiae of life seemed to slow the book down. Despite this I definitely wanted to keep reading this mostly soft tale looking at ageing, roots and reflection. I have a feeling this story will stay with me for quite some time. I guess this could be seen by some as a dark and even depressing read. However it never really felt like that to me. Was it what I was expecting from a Henning Markell book – nope, but it was often a powerful read. Parts of this book are just so good, poetic, deep and emotional. I loved those parts. However equally some parts are simply the ramblings of an old man and left me more indifferent. There is an outcome in some senses and I guess more than one, and I found those satisfying. A memorable if somewhat rambling read.